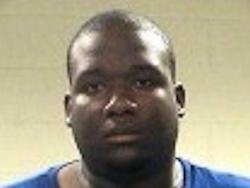 Antonio Terrell Graham, 32, of Kilgore was charged with felony possession of a controlled substance. Corrigan PD Makes Drug Bust in Routine Traffic Stop, CORRIGAN, April 30, 2013 - At 6:07 pm on April 26, 2013, Officer Timothy Stuckey with Corrigan Police Department stopped a vehicle, driven by Antonio Terrell Graham, 32, of Kilgore for speeding on US-59 north. Officer Stuckey pulled the vehicle over in the parking lot of Corrigan/Camden High School. At the time of the stop, Corrigan PD was working a drug interdiction task force. On this day, standard protocal was to walk a canine around every vehicle that was pulled over. Officer Canine "Dingo" with Hallsville PD was walked around the vehcile. Officer Dingo alerted the other officers of contraband on the passenger's side of the vehicle. Dingo was handled by Officer Derek Phillips with Hallsville Police Department. Additionally, Officers Javier Segura and James Hight (both with Corrigan PD) arrived to assist Officer Stuckey. Probable cause was established and the officers initiated a vehicle search. Right as rain, Dingo's alert was true. The officers found a large amount of prescription pills: K9 Dingo alerted on passenger rear door seam; found 3 different types of drugs; Hydrozodone, Oxycotin, Xanax bars and 2 types of Flexiril. Total weight was 126.4 grams. Antonio Graham was placed under arrest and charged with possession of a controlled substance (a felony). Special thank you: Corrigan PD and Johnna Lowe: Johnna Lowe provided pictures below and contributed greatly to this story. Police Officers with Corrigan and Hallsville PD search an suspect vehicle in Corrigan. K9 Dingo alerted on passenger rear door seam; found 3 different types of drugs; Hydrozodone, Oxycotin, Xanax bars and 2 types of Flexiril. Total weight was 126.4 grams.